Now you can get this Winnie the Pooh And Tigger Pin. 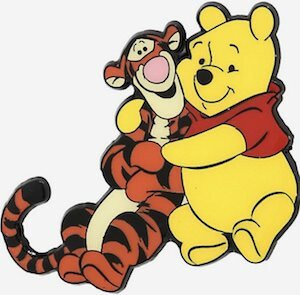 This pin shows Winnie the Pooh and his friend Tigger closely together and just looking cute. The metal pin has an enamel finish which makes it bright and just nice looking. A pin like this deserves a special spot on your clothing or maybe a backpack so that lots of people can see these classic creatures we all know and love. The Winnie the Pooh pin is 1 3/4 x 1 1/2 inches making a great size to stand out in between all the other pins you own. Now you can have a Harry Potter And His Owl Pin for on your clothes or maybe a bag. 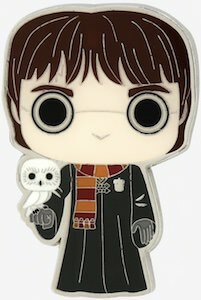 This is an enamel pin is 1 1/2 x 1 inch and shows Harry Potter in his Hogwarts robe and with a scarf and on his right arm you can find Hedwig his owl. A fun metal pin like this is great for on your clothing and also will look great on your school backpack or maybe the strap of your shoulder bag. Now you can take Harry Potter everywhere you go and I am sure that people will be admiring this fun pin that shows the classic Harry just like we know him from when the stories started. Now you can have a Riverdale Button Set. This is a set of 4 buttons that show things like the South Side Serpent and the River Vixen logo’s but there is more because they are all you really need to show people around you how big of a fan you are of the Netflix show. The Riverdale buttons are 1.25 inches in diameter and will look great on shirts, jackets, caps, or maybe you backpack. Now you can show off what you like to watch when you are not in school. Support Riverdale by pinning these buttons on your clothes or gear. If you like buttons and dinosaurs then check out this Jurassic Park logo pin. This pin is shaped like the Jurassic Park logo and it looks like the real logo too and that means that you can transform any piece of clothing or fabric into a Jurassic Park item. A button like this is great for on your shirt, jacket, backpack or maybe even your hat and by pinning it on you are all set for seeing the Jurassic Park or Jurassic World movies. If you are a true Harry Potter fan then you are going to like this Platform 9 3/4 button. This is the button you need to get access to the Hogwarts Express the train the drives Harry Potter to Hogwarts. This fun round pin back button is white with a black edge and on it it simply says “9 3/4” and that will make it clear to all the Harry Potter fans that you are one of them. A nice button like this will look great on your clothing, bags, jacket, or maybe a baseball cap. So be ready for a ride on the train by adding this button to your clothing. If you like Rick and Morty then you should check out this happy Rick pin. The enamel pin is shaped like the head of Rick with his light blue pointy hair and his mouth is wide open as he looks really happy to be pinned on anything you own. Made from iron the Rick and Morty pin is strong and has a classic butterfly clutch to keep it in place when you pin it to your outfit. 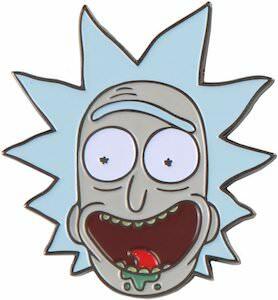 An official Rick pin like this will look stunning on clothing but would look great on a backpack or cap to and if you click on the “Buy Now” button you will see that there are different Rick and Morty pins too. If Westworld is on your mind then you should be checking out this I love Westworld button. The black pin back button has a 1 inch diameter and is what you need for on your clothing or maybe you backpack. On the button it says in gray “I Love Westworld” but instead of the LOVE it shows a cowboy hat because you heart cowboy life and Westworld . So shows people that you are a true Westworld fan by having this pin exposed and you may even get some new friends to talk Westworld with and that is all what you really want as it is an amazing TV show. Now Game of Thrones fans can show their side by wearing this Daenerys Targaryen pin. 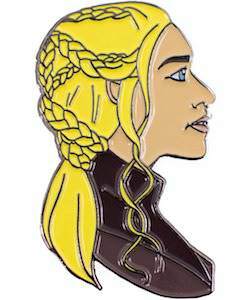 This is a metal pin with an enamel finish and the pin is shaped like the head of Daenerys and her blond hair has nice braids and all of it really looks like the mother of dragons. So now by putting this pin on your clothing or maybe a bag or hat you will tell people around you that you are a fan of Game of Thrones and especially Daenerys Targaryen. Pins are great to collect as they take up little space and are great for decorating your outfit. If you Baymax is your favorite movie character then you should check out this Baymax pin. The Big Hero 6 character can now be part of your life thats to this button. The pin is oval just like the head of Baymax and shows his eyes and besides that you can see his white skin and a black border. Just put this pin through your clothes, hat, or maybe your school bag and just by doing so you are ready to shows your friends that the helpful Baymax is now part of your everyday life. If you are a big fan of buttons and the TV show Friends then you should check out this Friends button set. The set includes 4 buttons that have a 1.25 inch diameter and on it you can find typical things of the show. The buttons show the cast, Central Perk logo, How You Doin’?, and He’s her Lobster! And will bring back fun memories of this classic TV series. Buttons like this are great for on you clothing bags, and hats and you can choose to use all four at once but you can also mix and match so that it you can look different when ever you want.